Our time in Houston was limited but productive. We left around 10:30am from Austin, picking up our ridesharers Crystal and Dustin (I had misunderstood their address), and they were rushed because they had to be at a wedding in Houston at 2pm. I drove relatively quickly, getting us into Houston at 1:20. Along the way, they had written down in my notebook a list of places to eat and things to do in the city. We dropped off Crystal, then Dustin, and headed straight for our host Josue's house. He lives just south of central Houston in a big house that he has been thoroughly renovating for the last couple years. He was extremely welcoming. We had our introductions, dropped off our stuff, and then headed straight for the NASA Space Center, about 45 minutes south of the city center. Along the way, we ate at a Popeye's Chicken, in a noticeably more... ghetto part of town. There were high school girls washing cars in the Popeye's lot to raise money for their school. A homeless man approached me (at close range!) for some food. There was a traffic jam on the 45 south headed toward NASA, so we detoured around to get there. We parked, and as I walked in to the space center, I had to do a double take and make sure that I was in the right place. The space center looks like a big Chuck E Cheese's, full of games and rides for kids. 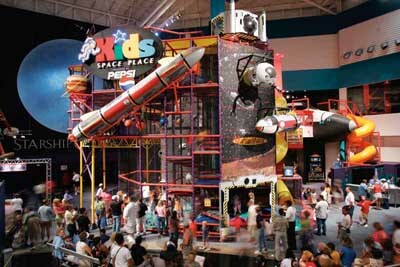 It had the atmosphere more of a laser tag course than of the site where they guided The US's historic space missions. I really expected more of a quiet museum. Whatever. Our time was limited, so we went straight for the tram tour that would take us to visit the actual mission control room. I expected a shabby tour, staying on the tram (which was just like the ones on the backlot tour at Universal Studios), but it actually was better than I expected - we actually got to go outside and into the mission control building to see the room, and then we were driven to a hangar housing a historic Saturn V rocket. We powered through the other exhibits at the space center and then headed back into Houston, driving through downtown. We drove by Minute Maid Park, where the Astros were playing a game. Then back to Josue's, and Josue took us out to a wonderful dinner with his 2 kids at Niko Niko's, a great Greek restaurant that was featured on Diners, Drive-Ins, and Dives. He then drove us around in his truck, showing us a few nearby bars, and then took us to a small meet-up of local couchsurfers. It was late and the kids had to sleep, so we were at the meetup for only a little bit. But I got to meet a husband and wife (from California) who were traveling around screening the film they made; I also met Natalie and Charlee, whom she had dragged over from the comic book convention that was going on that weekend (he's also known as the "St. Louis Superman" - google him!). Ueli and I slept in for a bit, not getting up until around 11. It was about time to hit the road so we said our byes and left. I drove us around, passing by the Astrodome and Reliant Stadium, then by some of Houston's renowned medical centers, a part of Rice University, and through the Montrose neighborhood (where we were the previous night) to try some kolaches. Kolaches are apparently a Houston specialty, but it's not that great - just a small sausage in a piece of bread. My mind was not blown. As we left Texas, driving east on the 10, we spontaneously decided to detour south to the Gulf Coast, which added an hour or so to our 5-hour drive. We crossed over Sabine Bay and into Louisiana, where we drove for a few minutes before stopping at Gulf Breeze Beach to dip our feet into the Gulf. The water in the Gulf of Mexico is murky and yucky! It was brown and the waves were choppy. There were beach flies and gnats swarming around piles of decomposing seaweed. The water was warm, though, and at least there was no oil washing ashore from last year's spill. Ueli then drove us onward, passing through bayous with locals going fishing at small outposts along the way. We still had no host lined up for us in New Orleans; Ueli kept saying that we should just ask random people to host us when we get there, and I frankly wouldn't mind sleeping in the car for a night. I had posted on the couchsurfing last-minute group asking for someone to call if they could host, but no responses to this point. But the road went on, and we (literally!) were halfway there, (whoa) living on a prayer!